Ryan Baldi was part of RIT’s Formula Racing team, and he returned to campus this past spring to celebrate the 25th anniversary season with alumni from across the country. 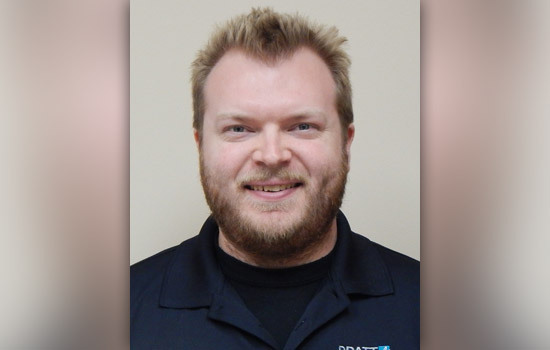 The mechanical engineering alumnus is currently an IndyCar simulation and modeling engineer at Pratt& Miller, and works closely with championship racecar teams. Even before racecar drivers head onto the track, they have lapped significant miles through simulation programs to prepare for every demanding curve and straight-away. Building those program systems is RIT alumnus Ryan Baldi. 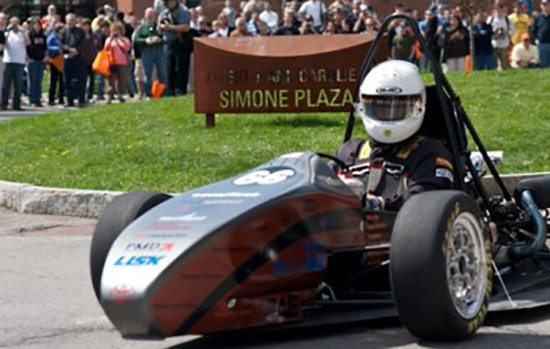 He has taken his experiences in the Kate Gleason College of Engineering and as part of the RIT Formula Racing team and turned them into a winning career in the competitive world of auto racing. Today, engineers are as important to race teams as drivers and well-coordinated pit crews. Baldi ’10 (mechanical engineering) is an IndyCar simulation and modeling engineer at Pratt & Miller Engineering and Fabrication. He develops the vehicle dynamic simulation tools used by Chevrolet teams, many of which have consistently won IndyCar Manufacturer’s and Driver’s championships. “One of the services we provide is computer simulation support. We model the car going around a track on the computer, so drivers can figure out what the car will do in certain scenarios—what makes the car go fast, how best to set the car up, things like that,” said Baldi, who splits his time between the Pratt & Miller corporate site in Michigan and with race teams in Charlotte, N.C.
Simulator screens are nearly 20-feet in diameter, projecting an image of both the cockpit found in the race vehicle and the track set up. Baldi also helps train drivers using the simulator, particularly for races taking place on city streets rather than dedicated racetracks. Learning about project management began when Baldi participated with the RIT Formula team. He began on the design team that built components and systems, then moved into leadership positions, helping to coordinate the overall build process. He would go on to work at Tesla as a chassis engineer, then spend four years with Richard Childress Racing, one of the top racecar teams in the country, as lead vehicle performance engineer. Responsibilities as part of RIT’s Formula team, which is currently celebrating its 25th anniversary season, was a way to apply concepts learned in the classroom into the engineering process as a whole. Building race cars on the collegiate level is challenging, he said, and the competition among different collegiate teams varies with experience and resources. It was not unusual for students on the Formula team to put in more than 40 hours of work per week on the car—in addition to classes and other activities. When professional race teams cross the finish line, they’ve arrived there with the combined skills of a fearless driver, a well-built vehicle and strategic use of technology. They can be confident that the technology has been built by a guy with similar credentials.